A network connection has been lost in the middle of communications, or the JVM has run out of memory. A checked exception is an exception that is typically a user error or a problem that cannot be foreseen by the programmer. For example, if a file is to be opened, but the file cannot be found, an exception occurs. These exceptions cannot simply be ignored at the time of compilation. Runtime exceptions: A runtime exception is an exception that occurs that probably could have been avoided by the programmer. As opposed to checked exceptions, runtime exceptions are ignored at the time of compliation. 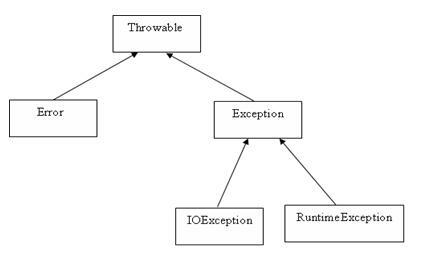 The Exception class has two main subclasses : IOException class and RuntimeException Class. Following is the list of important medthods available in the Throwable class. In java it is possible to define two catergories of Exceptions and Errors. Programmatic exceptions . These exceptions are thrown explicitly by the application or the API programmers Examples: IllegalArgumentException, IllegalStateException.